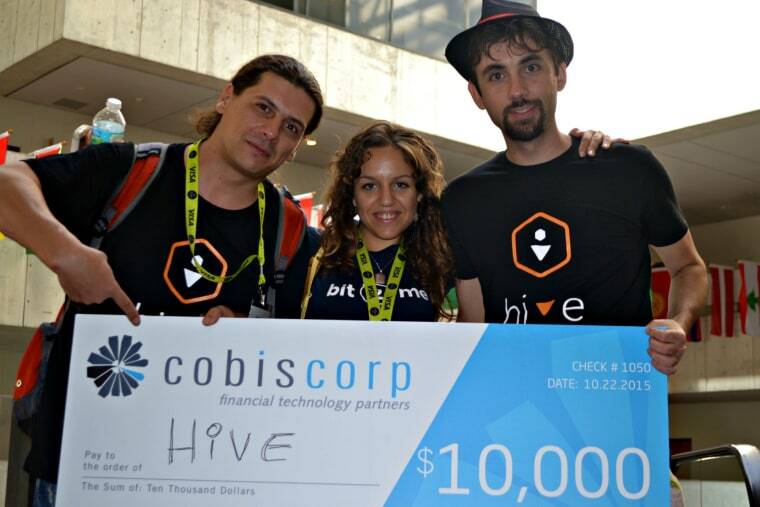 "Hive" -a startup based in Spain- won first prize in the remittance hackathon at the second Fintech Americas Banking Disruption Conference in Miami. From left to right: Bogdan Stirbu, Salvia Santos, and Leif Ferreira. MIAMI, FL – Hundreds of IT experts, financial executives, and professionals have converged in the city known as “the gateway to the Americas” for the second Fintech Americas Banking Disruption Conference to explore how today’s world of technology can impact the banking sector in the U.S. and Latin America. Financial Technology companies, also known as fintech companies are usually startups that offer alternatives to traditional banking, like using mobile phones to send and receive money. In the past, banks have stayed away from startups that have been disrupting their traditional model. But that has all changed. Global investment in fintech has accelerated during the past few years, totaling 9.9 billion in the U.S. alone during 2014, according to Accenture and the Partnership Fund for New York City. Ray Ruga, Co-founder of Fintech Americas, speaking at the second Fintech Americas Banking Disruption Conference. Ray Ruga, co-founder of Fintech Americas, is one of those who have set their eyes on Latin America, where the field of fintech has gone largely untapped. “The stage is set for major disruption [of the banking sector],” says Ruga. In a region where around 130 million people live in poverty and 210 million –or nearly half the population - don’t have a bank account, fintech can have a real impact on people’s lives. The unbanked have to carry out all their transactions in cash and don’t have access to credit cards, checks, and other tools that make life easy. It means waiting on a long line to pay a utility bill and not being able to save for a home or retirement.These people cite cost and documentation as barriers towards holding a bank account, according to the World Bank. But, an increasing amount of people around the world are circumventing these obstacles, by using mobile money as opposed to a formal bank account. Nicolas Cary, co-founder of Blockchain - the largest Bitcoin wallet - was at the conference. He tells NBC Latino they are seeing strong growth in frontier and emerging markets, especially Argentina and Venezuela, where people have traditionally had poor access to financial services. The rate of adoption, says Cary, is quick. “How is someone in Latin America going to get banked if they don’t have proof of existence, if they don’t have a utility statement. Well, if they’re 16 and they can download an application on their phone they’re just going to use that,” Cary says. The three finalists of the remittance hackathon at the second Fintech Americas Banking Disruption Conference. Access to non-traditional banking can be crucial for underdeveloped regions where financial experts see a link between access to financial services and climbing out of poverty. But it doesn’t have to be limited to mobile apps. In Mexico, only 39 percent of the population have bank accounts, according to the World Bank. But credit card holders don’t need an account to pay their monthly bill; they can pay bills, for example, at a chain of convenience stores called OXXO. Daniel Rojas, who was at Fintech Miami, founded a website in Mexico called rocket.la that allows people to find the best credit cards suited for them. “I saw a big opportunity to really help people because the regulations in the banks are too complicated,” Rojas tells NBC Latino. In order to launch Rocket.la, Rojas sought the help of Startup500, an early stage global venture capital firm and one of the most active Silicone Valley-based companies outside the U.S. “The questions is: how do we bank that 75 percent of that population? There has to be an entry point,” said Juan Lopez Salaberry, a partner in Startup500. In the U.S., technology and the smartphone have also been opening up financial alternatives for Latinos and their relatives in the area of remesas, the remittances or funds that immigrants send to help their families in their home countries. Latin America and the Caribbean received over $65 million in remittances during 2014, according to the Inter-American Development Bank. Creating an app that would allow people to send money from their smartphones would reduce time and fees. Ahead of the Miami conference, Fintech Americas held a virtual hackathon to come up with technology solutions on how to make remittances faster and cheaper for users. The winners, Bogdan Stirbu and Leif Ferreira, created a startup called Hive are now looking for funding to continue with their project. The Fintech Americas conference, which ends Friday, is pushing Miami as one of the next U.S. tech hot spots, particularly for Latin America. “We are managing a lot of financial assets in the region. So there’s a strong regional position and a lot of concentration of companies here,” said Wilfredo Fernandez, director of the Idea Center at Miami Dade College, a place that offers programs for entrepreneurs. Fernandez is also the co-founder of The Lab Miami, one of the city’s first co-working spaces to encourage entrepreneurial innovation. Those in the areas of technology and finance have honed in on Miami's proximity to Latin America and its strong Latin American presence. Raising money in Latin America is difficult because of financial risks -whether perceived or real. But in Miami many feel comfortable enough investing in technology and companies that can have a real impact on the financial betterment of millions in Latin America. “Innovation is doing things better, and more effectively. It’s not about revolutionizing but evolution-izing,” said Ruga.